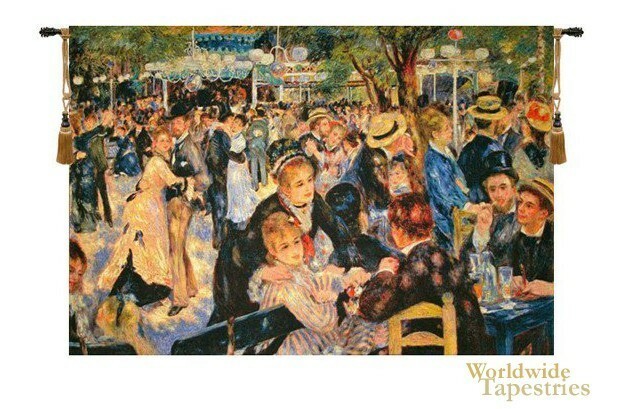 Bal Au Moulin De La Galette shows the wonderful work of Renoir from 1876. Here in this glorious work, we see a Sunday afternoon scene in the Montmartre district of Paris. Renoir (1841–1919) was an artist which developed the impressionistic style. Here, working class Parisians are seen in this gathering in the city where they socialise, eat and drink into the evening, including the eating of gallettes or round crusty cakes. In this scene, we see the wonderful play of light on the scene, creating dappled lighting. The dress and garments of the ladies and gentlemen are seen in this work, which celebrates the celebration of life in the 19th century. The original is in the Musee d'Orsay in Paris. Bal Au Moulin De La Galette tapestry is backed with lining and tunnel for easy hanging. Note: tapestry rod and tassels, where pictured, are purchased separately. Dimensions: W 56" x H 36"
Dimensions: W 76" x H 50"
Dimensions: W 116" x H 78"